According to Bob Melvin there are four big tech drivers in regards to UUV development today: com- munication, navigation, energy, and autonomy. • Communication: Physics are limiting our ability to make a giant leap forward in acoustic commu- nication data rates but the understanding of our current limitations and propagation effects has allowed us to get the most out of what we have. • Navigation: Nav iss become more accurate as aiding using acoustics is now the standard. • Energy: It’s going to take a tech breakthrough that solves not only the density issue but safety. • Autonomy: Similar to what an operating sys- tem is on PCs, the OS became the most important component on your computer. 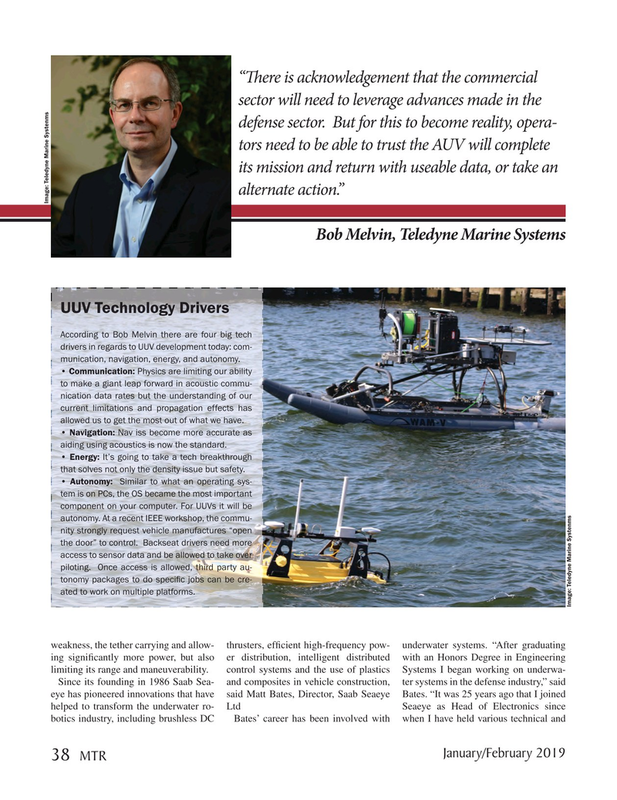 For UUVs it will be autonomy. At a recent IEEE workshop, the commu- nity strongly request vehicle manufactures “open the door” to control. Backseat drivers need more access to sensor data and be allowed to take over piloting. Once access is allowed, third party au- tonomy packages to do speci? c jobs can be cre- ated to work on multiple platforms.